Peterborough Panthers sealed their place in the SGB Championship play-offs last night (September 11) without turning a wheel. The table-topping city side are now assured of a top-four finish after Glasgow slammed Edinburgh 56-34 in a Scottish derby showdown. Edinburgh were one of the teams who could have overhauled Panthers, but the Monarchs are now six points adrift with just one match to go. Panthers remain five points clear of Glasgow and Workington, who they face on Friday (September 14) in Cumbria. The city club’s final meeting of the regular season follows on Saturday as they take on another set of play-off hopefuls - Lakeside - at the Hammers’ new Rye House base. Glasgow, Workington and Lakeside could all finish above Panthers depending on results this week. Panthers team boss Carl Johnson said: “It’s fantastic to be assured of a play-off place after all the work the lads have put in this season, but even though we have booked our place we will now focus on finishing in top spot. “Our target will be to pick up at least a point at Workington and Lakeside to hopefully make that happen. “Ending the season top would be special for everyone involved and give us choice of opponents in the play-offs semi-finals. 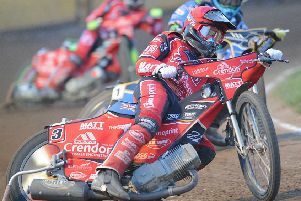 The two clubs will use six-man teams for the Perry Barr clash but Panthers only track two of their own riders in Ulrich Ostergaard and captain Simon Lambert. Frequent guests Ben Barker and Paul Starke also represent them along with Redcar man Jordan Stewart (who was part of the Panthers team that beat Berwick last Sunday) and Workington rider Mason Campton. National League outfit Birmingham have assembled a select side made up of Adam Ellis, Dany Gappmaier, Jason Garrity, Sam Masters, Ashley Morris and James Shanes.